Specialty Printing - Diverse Printing & Graphics, Inc.
There’s virtually nothing we can’t do. From labels to letterhead to I.D. badge systems, if you want it printed, bring it to Diverse. Wall Calendars - From a single UV laminated rolled sheet to a 12-month spiral bound calendar. Wallet Calendars - Credit card size with all 12 months. Your logo and message on a tough UV plastic card! Magnetic Calendars - The sky's the limit! We have many shapes and sizes to tailor your magnet calendar to best highlight your business. We have a wide-array of glass and crystal awards and wood and stone plaques for any budget! Awards can be use for employee retention programs. Awards tailored for a special client or special service award. Select It! We'll help you make the perfect selection — choose from more than 1,000 shapes, sizes, and designs. Customize It! Choose from a variety of imprint methods such as laser etching and 4-color sublimation printing — your imagination is our only limitation. Personalize It! 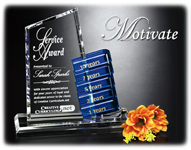 We can add any personalized message and artwork to your award. Package It! Elegant gift boxes are pre-labeled to make your event run smoothly! Everything from a standard business card to larger wall signs can be made of plastic for a long-lasting impact! Plastic badges for lanyard use. Plastic cards... EVEN CLEAR - that draw more attention to you and your company! Specialty promo plastics - such as luggage tags, rulers, book marks, key tags and much more! Special requests for punch holes or other attachments are no problem-just ask us! From a simple sign with an easel back, to more involved Point of Purchase displays, P.O.P. printing is our specialty! Low cost and low quantity table-tent cards for special events. "Danglers" for in-store displays and advertisements—for new and old products. Danglers work! Full-color counter top mats and displays! Window posters and temporary window "cling" labels and signage. Door hangers and gift card holders. And MUCH MORE! We'll work with you and develop your ideas with samples, mockups, and previews to get you the best R.O.I. for your next P.O.P. campaign! From a custom company Wine carton for the holidays to ANY boxes and bags to package your ideas just right! Cartons - MANY sizes from large to small—such as special event packaging of golf balls up to wine bottles and much more! Pillow-Pack Boxes - A great way to package items such as sunglasses, jewelry, and other promotional items. Our pillow boxes are the perfect retail and gift packaging solution. These high quality curved boxes are composed of a durable stock that provides a sturdy casing for the enclosed items. Sales Presentation Boxes - make ideal promotional packages for letter-sized literature. Ours include a top flap Velcro closure, tuck and tongue bottom, side glue and holds up to 9.75	" x 11.5" letter sheets. Cube Boxes - Offered in two stock sizes of 2.75" square or 4" square and composed of durable, thick stock with high quality print and coatings, our cube boxes are perfect for promotional items, cosmetics, and so much more. Golf Ball Boxes - The perfect choice for small promotional items, our Golf Ball Boxes can fit up to 3 golf balls and can easily be used to market anything similar in size. The boxes are composed of durable, thick stock with high quality print and coatings. They hold 3 golf balls, made with two straight tuck flaps, edge lock construction and NO GLUE requirements. Need a sample? Call us today! Customer Loyalty programs usually use either key chain tags, loyalty wallet cards, or BOTH. Complete card design, printing, and unique bar coding for your program. All our tags and cards are printed on heavyweight 30 mil PVC stock finished with a UV coat for extra durability. Proofs will be provided showing that our printed barcode is readable by your bar code scanner device. From a simple banner backdrop to a completely unique booth wall display and furnishing—we have you covered. Table Cloth Covers - All color with ANY graphics you want—including FULL Color on all 4 sides! Retractable Banner Displays - From tabletop to 8 foot backdrops! Outdoor Event Tents - Easy to assemble transport and store. Complete Packages of Complete Floor Displays - including custom backdrops, lighting, cases for transport, and our simple and fast assembly pop up displays! Call us today for ideas and sample 3D setups, made for your specific company requirements!